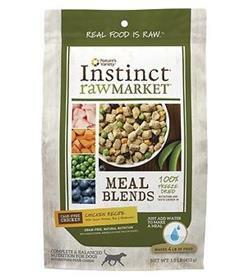 Nature’s Variety Instinct satisfies your dog’s need for real, raw nutrition with their Raw Market Chicken Recipe Meal Blends Freeze-Dried Dog Food. It’s raw feeding made simple—just add water to make a complete and balanced meal of cage-free chicken, sweet potatoes, apples and blueberries mixed with organic pears, carrots and butternut squash. Raw Market recipes are carefully crafted in small batches and freeze-dried to preserve the natural nutrients and flavor of real whole food ingredients. There’s no cooking involved in the process, which means all of the pure, unaltered nutrients will be easier to absorb so your pet can experience their ultimate health benefits.